I was commissioned to make some birthday cards recently. This post contains affiliate links – they will be marked with a *. The first card I was asked to make was a first birthday card for my cousin’s daughter. The only direction I was given was that mum/daughter like purple. So I set about designing a purple first birthday card! There’s just something about this super cute die cut design that I love. I’ve used it quite a few times in cards over the years. Because the shade of purple I chose was quite dark, and the die cut ‘1’ was in gold glitter, I kept everything else on this card quite simple. I was worried if I used a paper behind the elephant that was patterned the whole thing might look a little busy. Instead I went for a simple linen texture cardstock. I wanted to add a bit of depth to this card, and so I used 3d sticky dots on both the elephant and the ‘1’. I also tried to only fix the string in one place so it had a little movement to it. As I like to always make two of every card, I made a pink version. The gold and the pink go really well together here and I really like how this turned out. This version is currently listed in the shop. As always, I used my trusty Papermania cardstock*. It just makes picking colours so much easier and the quality of the card itself is fantastic. I’ve got three packs of this in my stash! A card just feels a little more complete (to me) if there’s a sentiment inside. So I added ‘Happy Birthday’ into each of these. 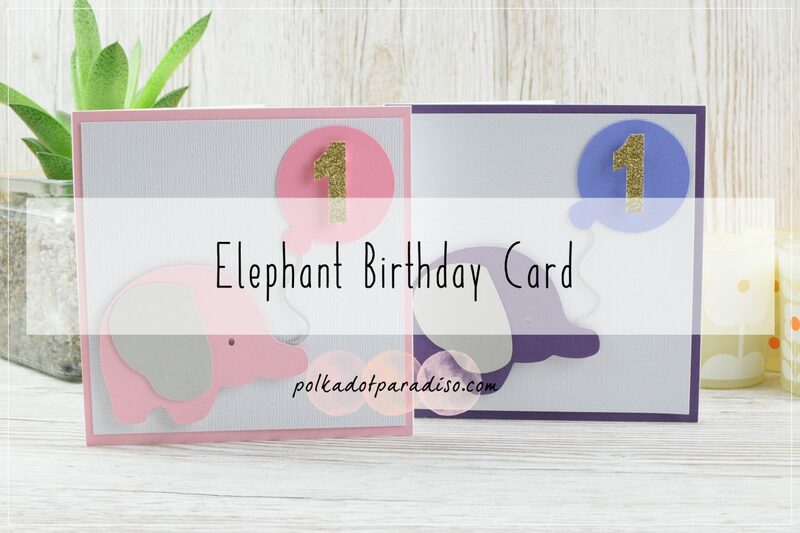 I should probably try and make a baby card without an elephant – but it’s just so cute!